28 Jan 2019 – A former United Nations rapporteur has criticised the US for engaging in “economic warfare” against Venezuela which he claimed was the real reason for the economic and humanitarian crisis facing the country. 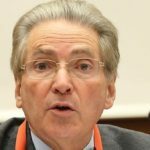 Alfred de Zayas, who last year became the first UN rapporteur to visit Venezuela for 21 years, also suggested in his recently published UN report, that US sanctions on the country are illegal and could amount to “crimes against humanity” under international law. What was really so “outrageous” about the points I made regarding the visit of President Obama and the G8 summit on Tuesday morning [18 June 2013]? The Government lackeys are not doing any favours for American people by offering Obama unquestionable adoration. We would serve them better by highlighting the tax havens which Ireland has kindly provided for big US corporations so that they can avoid paying tax in the US. “When I took my first Vicodin, it was like this feeling of ‘Ahh.’ Xanax, Valium, tomato, it’s same thing … F**k it, take it… They were gonna have to put me on dialysis. They didn’t think I was gonna make it. My bottom was gonna be death.” While the rapper is now clean, he admitted detoxing was a huge struggle.